Probably the best prototyping tool out there. Pros: Marvel is very easy to setup and work with. It has a great integration with Sketch: you just export the artboards through the Marvel plugin and they'll appear in the Marvel project dashboard. The interfaces is very intuitive and well designed. The team behind Marvel constantly push updates to make the product better. It has drag and drop functionality, transition and interaction effects like hover, swipe or stay on target that will help you create realistic experiences for web apps or mobile applications. Recently they added wireframe functionality so you can create test prototypes directly in Marvel. The free account is a good starting point and can be used easily if you don't need more prototypes at the same time. If you need more projects (prototypes) at the same time a paid plan should do the trick. You can share the link of the project with your clients very easily. Cons: Being an online platform, it doesn't work offline which means you need to be always connected to the internet. Also, there is no way yo get feedback directly on the prototype which would make the testing process more efficient. By that I mean, there is no option to annotate on the screens of the prototypes. The animations used for creating interactions between screens is most of the time limited to full-screen ones. You can't animate parts of mockups screens. For that you could use other prototyping services out there. Overall: Anyone working on web and mobile app should use this for user testing and client previews as it will help a lot in the feedback process without actually writing a single line of code. 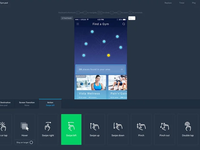 Its the best prototyping app i know, easy to use, friendly and intuitive interface ever! Pros: * Easy setup of hot spot and link betwen they. * Drag and drop funcion is the best. * Many effect like "hover" or "stay on target" that will help you to create a really natural experience of web and app navigation look a like. * you can use or create many projects in only one account. 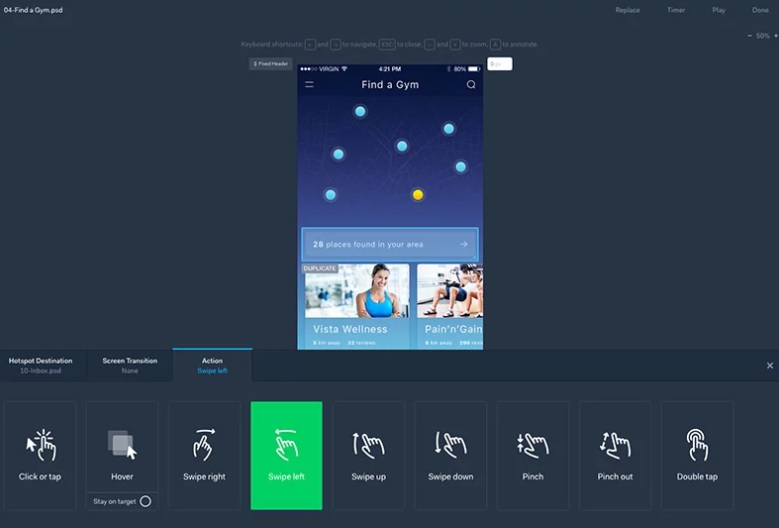 * Now you can wireframing in the app whitout need of any other app. * Share link to send your clients by email its a great feature too!. Cons: * I DOESNT HAVE AND OFF LINE APP!!!! * It should have a funcion that you can take a foto of a drawing sketch and convert they in IMG of your wireframes. * Iit should be able to WRITE COMMENTS over the imgs of a project. Overall: Any agency that works with digital product as web sites and mobile apps should definitly use this app!. Pros: This is one of the best prototyping tools I used. Very user-friendly and intuitive interface, great designed and constantly updated. Good intergration with Sketch, this is a big plus. It allows to test your ideas and userflows before making hands dirty with coding. Cons: The main cons is that the app supports mostly full-screen animations like switching the whole screen, not animate some pieces of the interface. If you need something more robust you need to use some full-stack prototyping tools like Principle or Flinto. Btw, guys behind Sketch recently released their new version (v39) which supports basic prototyping. So if you're a Skecth user you probably will prefer to use native resources for basic interaction. Pros: Easy to use prototyping tool. I like the plugins for sketch and photoshop. Cons: Not sure if it is a bug but I have notice lately that every image is organized alphabetical and that's a pain. I would like to be able to organize each image without having to worry about the name I use to save it. Rraises an idea for the development of an application or web. Pros: It gives you a great advantage in terms of design or front-end design of an application or website that can already prepare the style and functions that you can develop. Cons: It has some simple animations and the modifications in the mobiles are a bit bad and that makes many of the details can be seen in a simple view. Overall: I would like to improve the editing in terms of images, but the truth is that it is an excellent software for web design or applications. It helps you understand better the UX and UI of your design before you start programming. Pros: I used the app on both the mobile and desktop but I came to use it today on mobile because it's easy to do some quick animations while going to work or on the way to meeting with the customer. Also the option to put a link in your portfolio so that others can interact directly on your site with your mock-ups is great. Cons: I would have liked to be able to export in mp4 or gif the site or application, to make it easy to create a video presentation of what I'm creating. Overall: The first time I used the app, 2 years ago I had made the transition from design to print to design for mobile applications and site. I think it was one of the reasons why I was hired for the first time as a web designer. I realize that presenting your ideas as visually and interactively is very useful, both be hired and to win your clients. Pros: I love how easy the software is to use, barely any introduction to the app is needed in order to use it and it offers an amazing array of choice for transitional elements when designing a prototype. I use the app mostly to create prototypes of User Interface designs I make for college projects. Another great feature is that prototypes embed flawlessly into Behance projects. Cons: I feel as if maybe there could be more choice for animation transitions, maybe a few specialized looks for apps that may use less simple transitions like games and curiosity apps. Otherwise the app is great! Overall: I loved using it, it was better than Invision in the sense of ease of use. I prefer using Marvel when I need to do quick and simple prototypes that can be implemented into presentations quickly and accessed anywhere. Pros: Very user-friendly app, with intuitive and clean interface that allows you to create basic prototypes fast and easy. Contains integrated wireframing tool. Free plan is more than enough in most cases, until you need to work with many customers at the same time. Very easy to iterate experimenting with ideas, share prototypes with customers and receive invaluable feedback. Cons: It's hard to create complex prototypes because of limitations of the app. But the tool is good for basic interactions and simple designs. Overall: Good tool for creating basic prototypes! Pros: It's easy to use and works well both on desktop and mobile. Connection and transition are quite easy to explore and apply, almost all kind of transitions are available from a simple tap to gesture-based. Uploading from desktop or just synching from design tool works perfectly. Cons: Still no 3d touch and other complexes gestures, you need other tools like Axure if you need to build a dynamic prototype. Overall: Works well out of the box to create a prototype from static screens. Design, create, and present your ideas for web or apps. Pros: A more sensible way to create your web templates, does not require much knowledge since it has a very intuitive interface and makes the handling of the images very dynamic and everything goes around the functions that you have simulated in the design. Cons: It limits you to lock freely because it is a free version, but even so it gives the necessary thing unless your project is complex, for that the paid version is the best one. Pros: Marvel is an awesome tool we are using for years now. It is simple and do what we want him to do. We are using it mostly to prove feature concept inside the company. Sometimes we share it to clients so they can have a preview of what we will lunch in the future, to have feedbacks. Cons: The tool might need some new features. It's a goldmine that is not completely used, adding more transitions, more flexibility and this tool will beat all the competition. Pros: Ever since i started using marvel for prototyping, I've had great reviews and recommendation. It expedites my UI design processes as i can animate, link screens, make buttons clickable easier than ever before. I can share finished prototype project with client using URLs. Cons: Marvel has not got an offline setup for different operating systems. Inability to build prototype while offline might be discouraging but why bother if you're always on the internet. Overall: I've had and will always have an outstanding experience using marvel and I'm sure anyone who does will as well. Pros: Very simple and easy to understand. Offers a lot of transition and action options for Mobile Prototyping. Easy to share prototypes on multiple platforms. For static, simple prototypes, I actually prefer Marvel to InVision. Cons: Lacks some robust animation and prototyping ability compared to the newer prototyping tools and features coming out recently. Overall: This is an OK overall prototyping tool. In the realm of static, non-dynamic prototypes, I like it best. However, a lot of design tools and prototyping software are coming out with very easy to use features that give you more closely mocked prototypes to show stakeholders, team members and Dev Teams so things don't get lost in translation. For that reason, I say it's just OK. But by no means a "bad" prototyping tool at all. Pros: Easy to use and onboard, and has handful list of features. Responsive layouts and well received across different industries. Prototypes are easy to share and distribute with different teams. Cons: Feature discovery is a bit harder. Apart from that haven't come across any issues with the tool. Pros: This tool is excellent to make wirefrimes en mockups, is easy to use and yo have a free trial where you can create 2 projects with prototypes. You can share the URL of your project with anyone, no necessary have to be a member of Marvel. Cons: The pricing are to high and de free trial just allow 2 projects and 1 user. Overall: This tool helped me to make a prototype of many projects of the company where i am currently work. No coding required...very easy to use and the best prototyping App ever! Pros: a very intuitive and sweet design interface which allows you create simple prototypes very fast and easily. another part i like is it doesn't include coding or little programming stuff. it is also very-user friendly, easy to navigate and get job done quick. Cons: it is not applicable for building complex prototypes. this is due to its limited features. 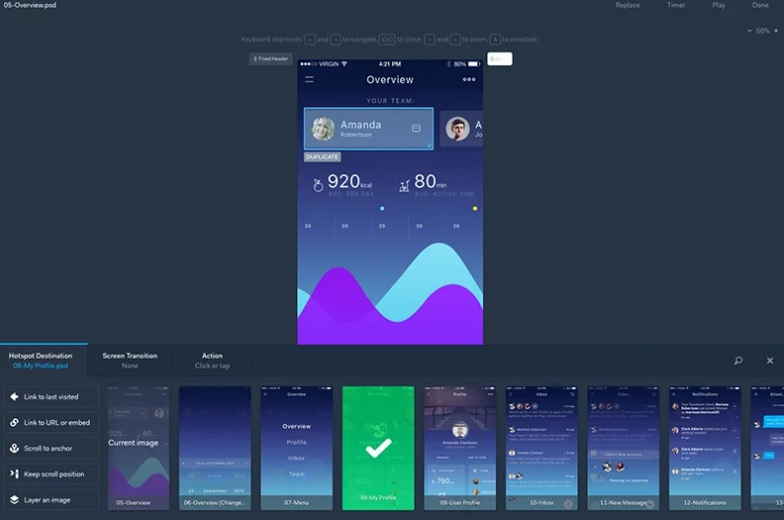 Overall: it is basically the best app for building simple, easy prototypes quickly. Pros: Very easy to use right off the bat. The tools are easy to understand and use, there are no hidden features that experts can use. I used this for both low & high-fidelity prototypes and found my clients loving them both as they can be quickly made & changes can be done with ease. Cons: At times when you are creating flows, it is easy to get lost especially with UI being consistent. Be sure to keep a close eye on where your flows are going to. Maybe a line symbol would work well as part of the creating experience. A great way to see what the customer what for his own product. Pros: Have a great features with an excellent use, like Hand Off and others. Have a way to put link between images. Cons: The trial version have limited options to add new users and more projects to see, they have to add a function for users that have a bad internet connection. Overall: Allows you like a developer see what the customer wants for his own app or site. Pros: We started agile and lean recently and I was looking for a tool to quickly create mockups. We looked into Invision and Marvel and decided to test out Marvel. Marvel was very easy to use - a junior UI designer with very little design experience was able to start quickly. Marvel also works with Lookback.io which was important for us to get feedback from users on our mockups. Cons: Marvel is not as advanced as Sketch or Figma but for its purposes, that may fit the bill. Pros: -It's amazing how easy is to make a quick prototype and it looks very worked up. Pros: - The best thing is the user can share the URL in a single click and the people who wants to see the prototype can easily view in the browser. Cons: - Mobile prototyping can be easily done, but there are lack of few mobile elements which is available in the competitor apps. Pros: I love Marvel since it offers integration with Sketch, so it's very easy to create designs and share them, also whenever you want to update your project, just use a button inside the app. The pricing strategy is very friendly for small companies as well. Cons: It could have some of the features offered by other services (i.e. : Invision) to create more complex interactions, although I don't have anything major to complain about, since we're using it for a few years and it works as intended. Marvel is a beautiful and powerful tool for design teams to rapidly prototype for web and mobile. Pros: Marvel works so fast to enable teams to upload screens from Sketch, mock screens in the web interface and very quickly build powerful, beautiful prototypes to convey UI concepts. Cons: Nothing. This app work better than InVision and its counterparts due mainly to its simple interface that enables rapid building and iterating through interactions. Overall: Marvel has enabled our design team to iterate and share prototypes at lightning speed without any hiccups or difficulties. It is solid, fast, and beautiful. Pros: This has to be one of the easiest to use tools for prototyping, the interface is clean and everything seems pretty obvious. Plus the ability to share projects makes it a great tool for collaboration and feedback. Cons: You have to be constantly online to use it, there is no way to use it without an internet connection. Overall: If you are constantly working on prototypes and testing them, you should really use marvel is simple and doesn't complicate things just for the sake of it. 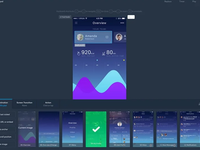 Pros: Overall, one of the best software for interactive Mobile App prototypes. The user interface is among the best, but what makes it unique it's the ability to easily download and install the prototype on your phone, even on iOs! As a bonus, it's also a good place to organize all your screen mockups, divided into sections. Support is also quicker than the competition. Overall: At my company we quickly needed to show a client an app prototype as authentic as possible, without opening it through a third-party software, but actually installing the app. Marvel did that job, and the prototype interaction, very well! Pros: Marvel is a really sweet prototyping tool, which looks great and offers a proper amount of features. The best part if it is that it allows adding animations, which is especially useful for mobile apps. Pros: Marvel is so incredibly intuitive. You can go in with no prior knowledge and find your way around the software and produce a first-class prototype. They also have a vast array of editing tools so you can edit your photos/screens in the app, saving you time importing new images. Oh and they also have one of the best weekly newsletters for web designers. Cons: I don't like that you can only create two prototypes until you have to pay for the app. I wish they had a version with basic functionality that could be free forever. Super easy and fast mock up prototyping. Pros: Sketch integrations makes it easy to synchronize images and record flows. Sharing and comments helps you gather information from your team. Cons: Editing in mobile app isn't great, specially small screen since it is more likely to prototype in desktop. Overall: Fast and free prototyping for desktop and mobile, it has helped me to prototype in minutes. Pros: Marvel allows you to easily create app mockups to share with teammates and customers. An easy WYSIWYG editor and intuitive controls make Marvel a great tool for mockups. Cons: It need some more transitions and animations, to make mockups and designs even better and more realistic. Pros: It's really intuitive to use, and it's based online which makes collaboration extremely easy. Once we've created a prototype, we can share it out to the larger team in order to receive feedback. They also send out published articles for consumption and host webinars to learn more about design. Cons: It's pretty expensive compared to other prototyping tools considering its capabilities. I wish that it could integrate with other software. Pros: Great integration with Sketch - my main design tool. Easy syncronization between Marvel and Sketch to update design to latest versions. Intuitively understandable interface. Cons: I'd like to be able to create more complex interactions between parts of interface and elements, not whole screens. Excellent tool to convert sketches into prototypes, quickly and easily. Pros: Easy access to the application. Converting sketches to prototypes quickly, computer and phone designs are excellent. Cons: One of its cons is the language, another one is that not all the people we can see the animations of the application, like the icons, they are not seen in all the devices. Pros: Design is a way to solve problems. Marvel is really handy to produce and showcase the tangible solutions to get meaningful feedback from the internal team and also client. I can also do the hand over stage to developers, so no need to re-upload the same assets to several apps anymore. Can do them in Marvel. Cons: When will be able to have the type in the input field functionality built in? Pros: Some good features are there like screen previews, easy hotspot creation, integration with sketch is great. Pros: Everything! Marvel is so simple and easy to use. I've tried other prototyping tools and nothing is better. Cons: As you can see there isn't much I don't like. I guess I would like more customizability with the interface. Pros: How easy it's to create the design for app pages. How close to actual pages the prototypes look. Cons: It's more of a grudge to be honest, the app makes it so easy to create the design that people think it's equally easy to code the app. Overall: I'm very satisfied, it has helped me and my team to create many prototypes very fast as we developed our app. Pros: Marvel app gives you a freedom of creating easy and quick interactive prototypes. And what's the best is that you can test them directly on a mobile device. Cons: This tool provides unlimited quantity of artboards with 3 active projects. This app will be a great option both for freelancers and large companies. Pros: It's pretty simple and fast to create prototypes in Marvel, especially with the Sketch plugin. The UI is beautiful and straightforward. I was up and running in minutes when I first got started. Cons: I personally don't love that hotspots flash blue when you click the screen. It's useful in that it reveals interactive areas, but that's less helpful (gives too much away) when attempting to test usability. Pros: I am a huge fan of Marvel's UI. I love using it for quick prototyping, especially when working with higher fidelity wireframes. The drop down options from the library of components is always up to date with components (this is vital, especially since we get so many OS updates with Android and iOS devices when working on mobile). I really do love the handoff tools and being able to generate code and specs for devs. Cons: Performance. There have been instances in which heavier projects, or projects that contain designs with a lot of screens will slow down performance. Overall: It's such a good tool, and continues to surprise me with new features. I really like what Marvel has done with their UI. It makes my experience with it a little bit easier and more fun to use. Pros: Beautiful user interface. Easy to create prototypes. Companion apps on mobile makes it easy to share and review prototypes anytime, anywhere. Cons: The free plan allows only 1 project. Would have been better if the limit was a little higher. Overall: We used to use Marvel for prototyping in the last company I worked for. The app was a joy to use. Really helpful. Pros: I was able to download this, figure it out and create a project in less than 30 minutes. It was fun to use and offered insight into the proptype I was developing which I hadn't considered previously. Cons: It didn't seem like the favorites or staff picks had been updated any time recently. I would have really like to be able to see others' projects. Cons: I don`t have cons about this software, it`s very good. Pros: Good prototyping tool for those just beginning to create prototypes. It has very basic capabilities, but does integrate with both Confluence and JIRA. It also includes the ability to create CSS from your designs. Cons: A little too basic. It doesn't support more advanced features like animation. Pros: Once the prototype is made, it's instantly available in the mobile app for user testing. This experience is far better than having to share links -- which is what other prototyping apps do. Cons: The prototyping experience itself could become better. Navigating around different screens can becoming confusing. There is no way to easily organize repetitive screens and flows ( which may be essential for some use cases). Overall: Marvel is a must-have for productivity obsessed individuals and teams. It helped me deliver a prototype in just hours. Cons: It still has some room for improvement, including adding animations and making prototypes dynamic. Besides, it works online only, which adds some limitations to when you can use it. A useful tool when making prototypes for the design of applications, it helped me a lot in my work. Pros: I can upload images and place hotspots in specific places, to other images, what would be screens, being able to make prototypes of high quality presenting the flow of the application and allowing to share the project with other specific users. Cons: You have to pay to enjoy the software, it does not allow you to pass the images that you uploaded to pdf format. It has no compatibility with adobe, only with sketch app.